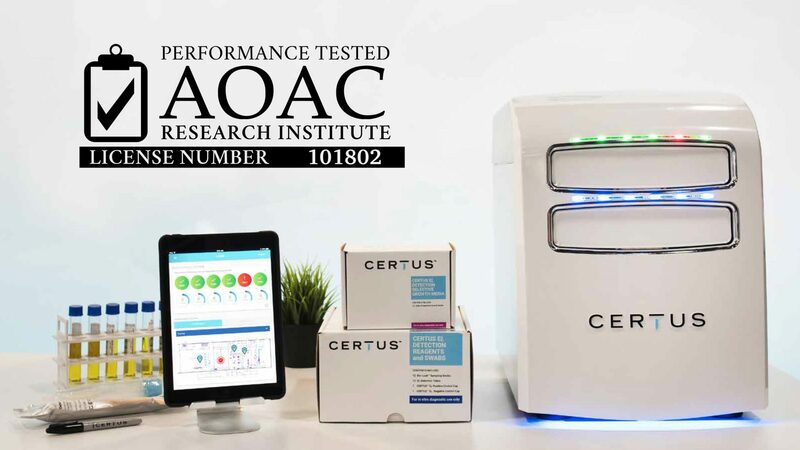 CHICAGO – October 23, 2018 – CERTUS, innovators in food safety technologies, announces that its CERTUS System for accurate and rapid pathogen detection has achieved AOAC Performance TestedSM certification (101802). As a result of rigorous validation studies required to achieve certification, AOAC validation provides small to mid-sized food processing plants further assurance on the reliability and efficiency of CERTUS’s in-house environmental Listeria monitoring process; a simple, safe and cost-effective way to deliver swab-to-result pathogen detection. Utilizing SERS nanoparticle technology, the CERTUS System features real-time detection which empowers food processors with the timely information they need to keep their products moving and protect their brand from a recall. The CERTUS System’s powerful combination of in-house capability coupled with real-time detection means producers have test results in-hand in less time than it takes for a third-party lab to receive samples by mail. Unique amongst in-house pathogen monitoring systems, AOAC has certified the CERTUS System for use on four environmental surfaces that include stainless steel, concrete, plastic, and ceramics. The CERTUS System also holds the particular ability to detect target organisms without destroying them, while dramatically reducing the impact of interfering substances commonly found in environmental food samples on assay results, leading to a 98% accuracy. With a limited number of CERTUS Systems now available, food processors interested in learning how to integrate the CERTUS System into their facility can schedule a complimentary, in-person consultation by visiting certusfoodsafety.com/consultation. CERTUS changes the way food safety testing is done and helps reduce food-borne illness with a rapid pathogen detection system that is Simple, Safe and Smart. CERTUS integrates historically embraced values into future technology bringing innovation and expansive vision to the food safety industry. CERTUS joins the Toho Technology group of companies as a new brand specializing in Food Safety.